I've always liked the silhouette of the kimono jacket but I never appreciated it until now. Even at this stage of my pregnancy, I can throw on a kimono and still feel like myself. It doesn't look like it shrunk of me (like so many other pieces do nowadays) and still has room to spare! Love this look and that kimono! Beautiful lace kimono! It looks perfect over the black, and with the denim and boots. Love the bag, and I am happy to see you, as always, with that happy bump! I would like to call it pregnancy coat :) perfect! Lovin' this -- too cute! Oooh! I love this lace kimono! We're both focused on boho today. Beautiful look, Nancy :) Love that lace kimono! So simple and so cute! What a pretty kimono! 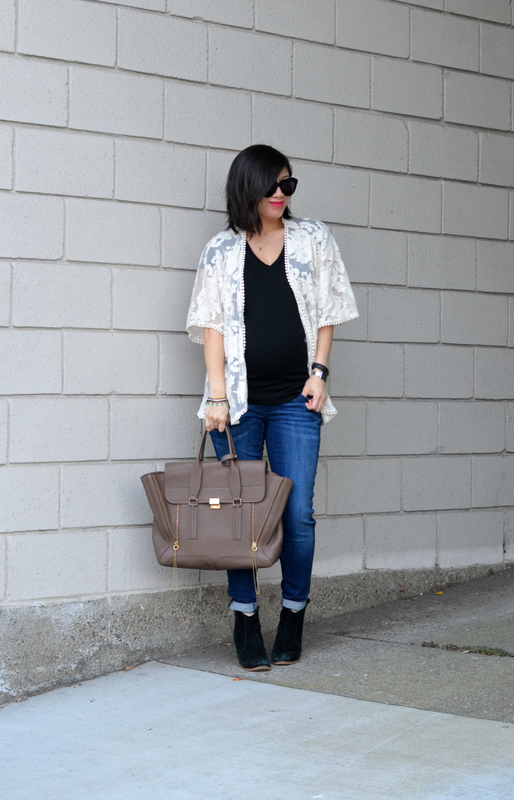 I love the flair that the kimono adds to your casual outfit! Love it. Love this gorgeous kimono on you! I loveeee this kimono, Nancy! A great kimono piece. I remember seeing this on your blog and all I wanted was a lace kimono in my closet. You are so beautiful. That baby bump is adorable. And I personally LOVE kimono's, I think you look great. I love , love that kimono!! Great kimono! It really looks lovely on and accents you haircut! I just scored one at Goodwill for $3!! I hope to share on the blog soon. That is the cutest kimono! Love the sheer lace detailing! I have never been pregnant, so clearly I say this with no authority but I plan on buying as many kimonos as possible. You're right, they totally still look stylish and you can just rotate them over a basic tee. You look so pretty here. I am still digging your shorter hair so much! Lovely outfit! And I love the bag, it would be perfect for college as it seems like it would hold a lot! I always love the different prints of kimono jackets. So pretty. Your cardigan is adorable! Love it! 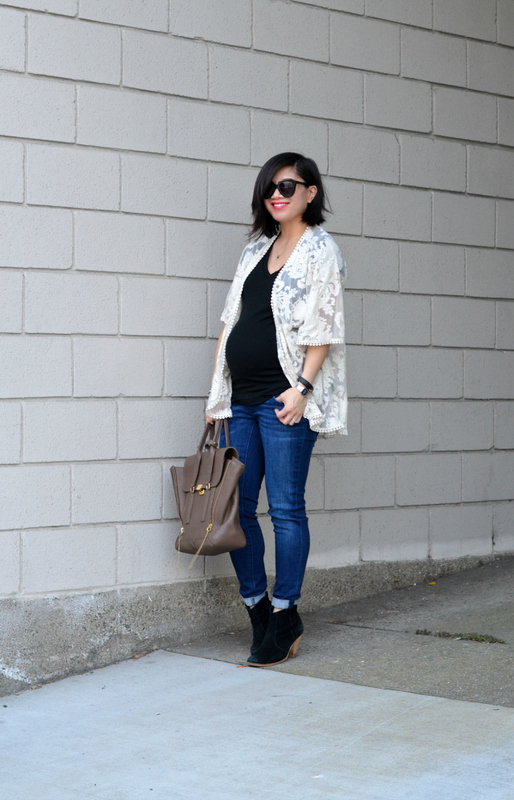 You look great girl, and I love seeing your stylish maternity looks! that kimono is fantastic!!! you are glowing and gorgeous!! The lace is absolutely gorgeous!